In May of 1960, Israeli intelligence officers were made aware that Nazi Lieutenant Adolph Eichmann was hiding out in Argentina. The drama Operation Finale details their efforts to find him and bring him back to Israel to face justice. It is an interesting story with some very affecting moments. Though, thematically, it touches on things like revenge versus justice, guilt, grief and memory, it uses them without really saying anything about them. Chris Weitz’s film is caught between fact based drama and thriller, never becoming totally comfortable with either one. There are a lot of good things in Operation Finale, but the overall production is too uneven to take advantage of this story’s full impact. The protagonist is Peter Malkin, an Israeli special operative. Like every other member of the team sent on this mission, he lost family during the Holocaust. Having one of Hitler’s top men in their possession triggers a lot of emotions among all of them. There is some compelling conflict inside the group between those who want to bring Eichmann in alive for trial and those who just want him dead. But that is not really what the movie is about. It is more of a spy film than it is one dealing with actions and consequences. 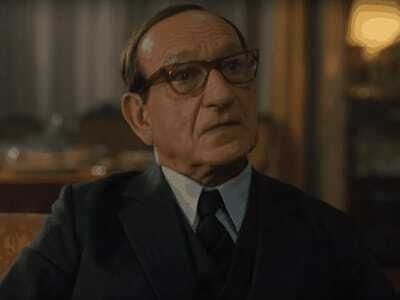 The real heart of Operation Finale, are the series of conversations between Malkin and Eichmann while they wait to go back to Israel. Those scenes have so much potential. Eichmann is played by the great Ben Kingsley, who can convey tremendous emotion in the simplest of lines. Malkin is played by the charismatic Oscar Isaac, quite possibly my favorite current actor, who makes a character interesting just by appearing onscreen. The idea of those two going at it in an acting duel causes my inner movie nerd to do cartwheels of excitement. Unfortunately, their conversations lack purpose. I guess they are trying to manipulate each other, but their mental chess game is underwhelming. It does not go deep into either of their psyches or mine the issues inherent in this story for extra drama. They both have strong scenes elsewhere (especially Isaac), which makes me wonder why the ones with the two of them felt so flat. The setup is intriguing, as are some of the sequences of group in-fighting. The movie does not bog down until after they settle into the safe house with Eichmann. It starts to drag once it becomes apparent Operation Finale is not going to address the questions it has raised. That said, it still has plenty of powerful moments, both from its cast and from its subject matter. Operation Finale fails to really turn the heat up underneath its main plotline. I was interested in the mission and the performances were good (also including Jewish actors Mélanie Laurent, Nick Kroll, Michael Aronov and Lior Raz as other members of the team). However, I was unable to get completely absorbed by the story. There is much to be learned from Operation Finale and (sadly) it contains truths we need to be reminded of right now. As history, it is very valuable. As entertainment, it is okay. Read Ben’s last movie review on Papillon.